Today’s 4.15 update for Final Fantasy XIV adds a massive new 48-person player-versus-player battle mode, but that’s not important. Bards can play music now. It’s beautiful and horrifying. 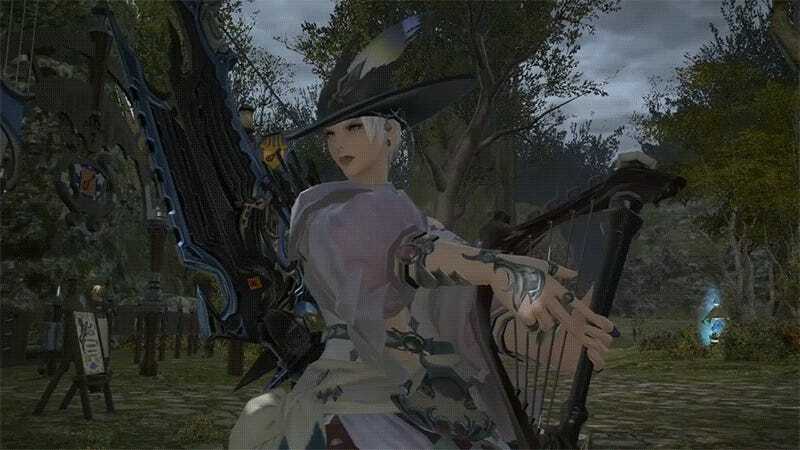 Players who have achieved level 30 as an Archer and have made the jump to the advanced Bard class can now travel to Old Gridania and finally learn to play that harp they’ve been carrying around. As long as the player can complete a quest involving clicking on a prompt, they’ll immediately gain access to three octaves of pure barding power. A special “Performance” tab opens up under the “Actions & Traits” section of the character menu, featuring almost too many notes. By dragging these notes to the hot bar, players can use keyboard shortcuts to perform music, or at least make noise. Note that in order to unlock these “Performance Actions,” players must agree to not use the tools for performing third-party music of any kind. That’s totally gonna stick. The tools are simple, but with the right macros and some synchronization, I’ve no doubt this new addition will eventually lead to in-game concerts, or maybe some musical theater. For now, non-Bards might want to steer clear of Old Gridania until the cacophony dies down. It’s pretty painful. Oh, and check out the patch notes to learn more about that new “Rival Wings” PVP mode. It seems nice.